Wing Lwazi Mvovo has replaced JP Pietersen in one of two changes by South Africa for their meeting with the United States in World Cup Pool B.
Tight-head prop Frans Malherbe makes his first Springboks start of the year, taking the place of Jannie du Plessis. Only prop Phil Thiel, number eight Samu Manoa and full-back Blaine Scully have kept their places for the United States after their 39-16 defeat by Scotland. Matthew Trouville, Niku Kruger and Zach Test all make their World Cup debuts. 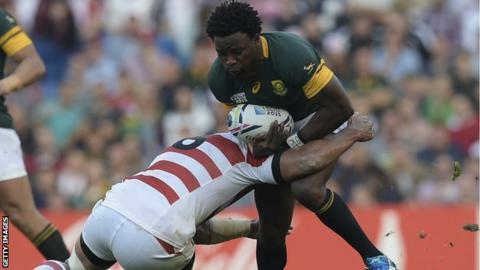 South Africa's veteran second row Victor Matfield, 38, is still rested after he sat out the win over Scotland, but Schalk Burger, 32, will equal former captain John Smit's national record of 17 World Cup appearances after keeping his place at open-side flanker. A victory featuring four South African tries would ensure the Springboks progress as Pool B winners to face either Wales or Australia in the last eight. However, after his team's upset at the hands of Japan in their opening game, coach Heyneke Meyer says he is not looking beyond the challenge posed by the United States. "They will be up for this match against us, waiting for us," said the former Leicester coach. "I watched their last game against Scotland and it was immensely physical," Meyer said of the Americans. "We have to be humble, keep our feet on the ground and realise it will be another tough scrap." USA Rugby chief executive Nigel Melville set his side a target of one win from their pool and, after defeats by Samoa and Scotland, coach Mike Tolkin has opted to focus on their meeting with Japan on Sunday. "With a four-day rest, you have to use the whole squad," Tolkin told reporters. "Every team that's been in this situation has had to do the same thing and we're confident in this full squad." South Africa have won all three meetings between the two sides, with each win coming by 23 or more points. South Africa's Bryan Habana (12) needs two tries to overtake Doug Howlett (13) as the second top try scorer in RWC history, while three tries would take him level with Jonah Lomu's overall record of 15. The Eagles have scored a try in their last 12 Rugby World Cup games - the fourth best current run in the tournament. South Africa: Willie le Roux; Bryan Habana, Jesse Kriel, Damian de Allende, Lwazi Mvovo; Handre Pollard, Fourie du Preez (captain); Tendai Mtawarira, Bismarck du Plessis, Frans Malherbe, Eben Etzebeth, Lood de Jager, Francois Louw, Schalk Burger, Duane Vermeulen. Replacements: Schalk Brits, Trevor Nyakane, Coenie Oosthuizen, Pieter-Steph du Toit, Willem Alberts, Rudy Paige, Morne Steyn, Jan Serfontein. United States: Blaine Scully; Brett Thompson, Folau Niua, Andrew Suniula, Zach Test; Shalom Suniula, Niku Kruger; Oli Kilifi, Phil Thiel, Chris Baumann, Louis Stanfill, Matthew Trouville, Danny Barrett, John Quill, Samu Manoa (captain). Replacements: Joe Taufetee, Zach Fenoglio, Mate Moeakiola, Titi Lamositele, Cam Dolan, Al McFarland, Mike Petri, Chris Wyles.